I attended the OMG meeting in Salt Lake City from June 22 to June 24. Here are a few highlights from the Analysis and Design Task Force (ADTF) meeting I attended on Wednesday 22. Pete Rivett is issuing today a RFC for a canonical XMI format at OMG. I think this is an extremely valuable proposal, because you all know that the complete XMI syntax is so complex and open that basically allow to define so many “XMI dialects” that it’s actually impossible to talk about interoperability of XMI documents among different tools. IMM – Information Management MetamodelPete Rivett also discussed IMM, a (revised) proposal to an RFP for bridging and mapping different specification languages covering the information management at large. In particular, the scope of IMM covers: the business world (ER), the data base world (Relational), the application world (XML Schema, UML, LDAP), traceability, and other models (ontologies, Semantics of Business Vocabulary and Rules). Cory Casanave proposed an RFP called SIMF that addresses “the data problem”, i.e., the issue of federating different systems and architectures that should share the same information. This includes all the issues of information sharing, interoperability, shared services, and so on. It might be considered the problem of the decade in terms of impact, cost, and volume both in private enterprises and public administrations. In terms of CIM/PIM/PSM layers, SIMF focuses on CIM/PIM, by defining models and mappings between levels and within each level. SIMF comprises a kernel model, a kernel of Common Logic. SIMF includes a language for specifying Conceptual Domain Models (CDM) and a language to express Logical Information Model (LIM) for describing data context, data structures and viewpoints. There might be overlap between CDM and LIM. Model Bridging Relations (MBR) aims at semantically relate similar information concepts. Expected submissions shall provide both visual and textual concrete sintaxes for CDM, LIM and MBR. SIMF itself should be federated. The feedback on this proposal highlighted that more than a standard on this (which is partly covered by other standards already) a set of other artefacts are needed: a methodology, possibly a book, and some tools. We will see..
Stefano Butti and I presented our experience with WebML and WebRatio and we opened a discussion on the need and the scope required for a user interaction modeling language. More details on this initiative can be found in my previous post here and Stefano Butti’s post here. 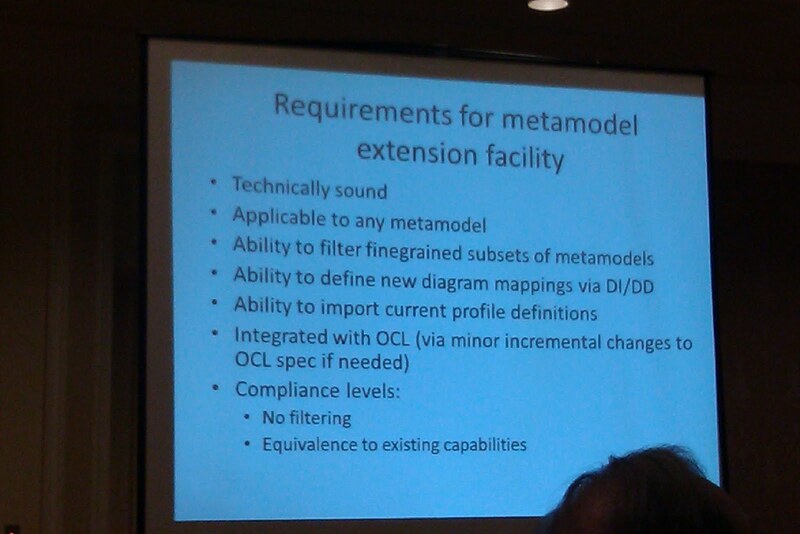 Steve Cook (Microsoft) presented the MEF proposal. The motivation of this stands Profiles have a lot of drawbacks: ambiguous purpose wrt metamodels, poor integration with OCL, weak expressive power (e.g., stereotypes do not support all features of MOF classes), applicability only to UML (e.g., BPMN is out), filtering not used, and so on. The RFP is quite challenging because the proposals should not overlap with MOF, support fixed-model tools, and also MOF-based tools. A quick summary by Steve himself is available on his blog. Ed Seidewitz presented a revised version of the RFP proposed at last meeting as ESSENCE. The RFP is co-authored by Ivar Jacobson and Arne Berre too. Ed Seidewitz presenting at OMG ADTF in Salt Lake City. The bottom line here is to foster specification of software engineering processes by providing a simple, easy to use specification language that is more agile than the existing proposals (like the SPEM and ISO ones). This would help practitioners design their own SE processes, without the need of involving expert methodologists (and consequent long and expensive design cycles). Personally, I think this is definitely needed in the software engineering community and also for teaching purposes. Other topics that have been addressed include: Web Architectures for ODM (by Elisa Kendall), creating an OMG standard UML profile for NIEM RFP (by Vijay Mehra and David Bray), Common Terminology Services Release 2 (Harold Solbrig), and Foundation for the Agile Creation and Enactment of Software Engineering Methods RFP (Ed Seidewitz, Arne J. Berre, and Ivar Jacobson). Bids Awards New & commercial Projects information .